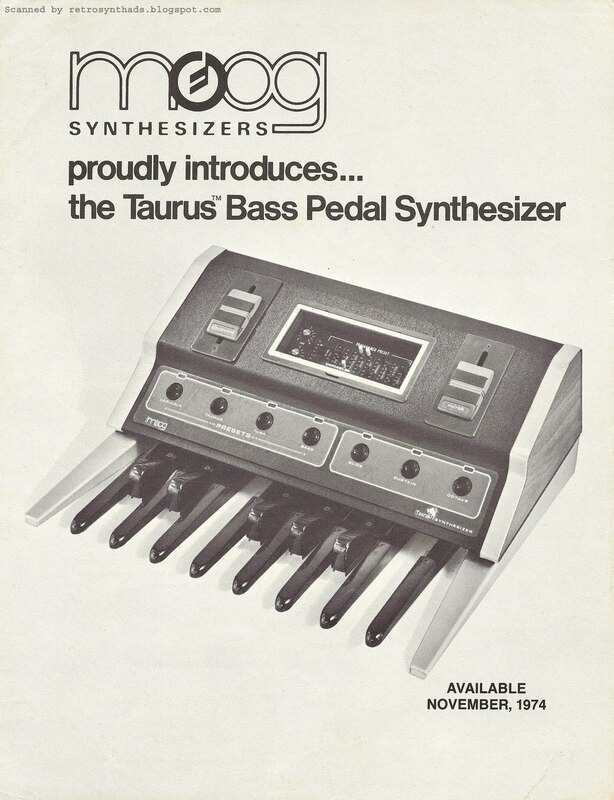 Moog Taurus Bass Pedal Synthesizer (aka Taurus 1) introductory brochure from 1974. 'Available November, 1974' <-- what a great piece of historic info. Most of the Taurus online references I've come across, such as Synthmuseum.com, Vintage Synth Explorer and Wikipedia, give a launch date of 1976 - not 1974 as presented in this brochure. 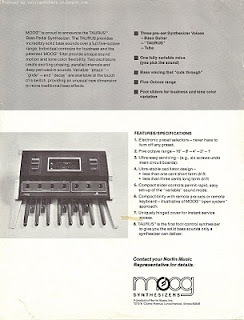 Granted, this info sheet was printed prior to the launch of the product and it wouldn't have been the first (or the last) time a synthesizer had been late getting into production. But, this brochure does give us some indication that at least at one point in time, the Taurus was *supposed* to be launched as early as 1974. And, just as importantly, that they had a prototype of the machine pretty much nailed down. There are a few clues as to why I think the instrument in the photo is a prototype. And the changes made between this early design and the final model were definitely to the machine's (and user's) advantage. 1. 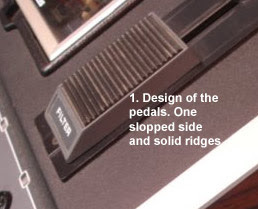 The design of the Loudness and Filter pedals: Every Taurus I've come across has pedals like mine - each one has 2" x 2.5" of solid ridges with only one slopped end (the end with the writing on it). The pedals in the ad-photo are divided into two halves, each with a slopped end. Advantage: Having only one slopped end has got to provide at least a 1/2" more foot contact. 2. 'Sustain' foot-switch: What is usually labeled the 'Decay' foot-switch on Taurus units I've come across, is labeled 'Sustain' in the ad-photo. 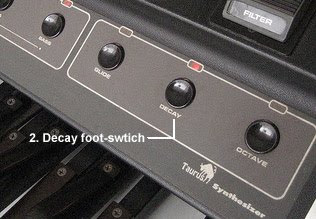 In Moog-like terms, I think 'decay' usually refers to a decay time and 'sustain' refers to a sustain level. Even within the 'Programmed Preset' controls, the Loudness controls include a 'sustain level', and next to it is a 'decay' control. Advantage: My guess is that the name change was to keep things from getting all-around confusing for the operator. 3. The colors on the Programmed Preset controls: All the original Taurus controls I've seen are white, except for the three red 'loudness' controls. Although you can't see 'color' in the photos, the shades of the controls are clearly reversed (light<-->dark), and were maybe even black and white. It might have been that they were changed for the ad-photo, but if so, why not make them all white so they would all be easier to see in a black and white photo. Advantage: Red and white controls are much easier to see on stage than the mostly black controls featured in the photo. 4. 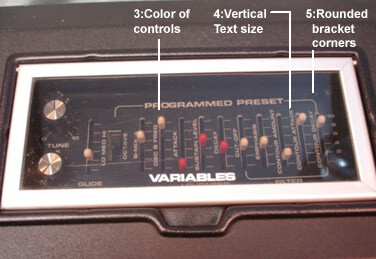 The vertical text beside each Programmed Preset control: In the photo, the vertical text beside each of the controls appear to be smaller than on the Taurus's I've come across. You can see this really well on the last three controls - the Contour Amount, Attack and Decay controls. In the production Taurus's, the text is so large that it passes the 0- and 10- markings. In the photo, the text doesn't. Advantage: The larger text is easier to read. 5. 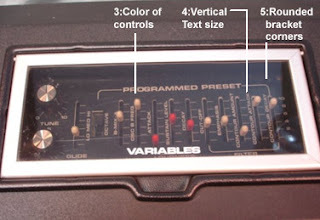 The screened-on brackets flanking the 'PROGRAMMED PRESET' control text: In the ad-photo, the bracket corners appear square, but in the pedals I've come across, they are all rounded. Advantage: Pure style. The rounded corners compliment the rounded corners of the boxes surrounding foot-switches. If those clues don't scream PROTOTYPE, I don't know what would. But, maybe it is just an early model and there are some out in the wild. Let me know if you see one! Before I sign-off I have to mention that whenever I look at this brochure, two other things always jump out at me. 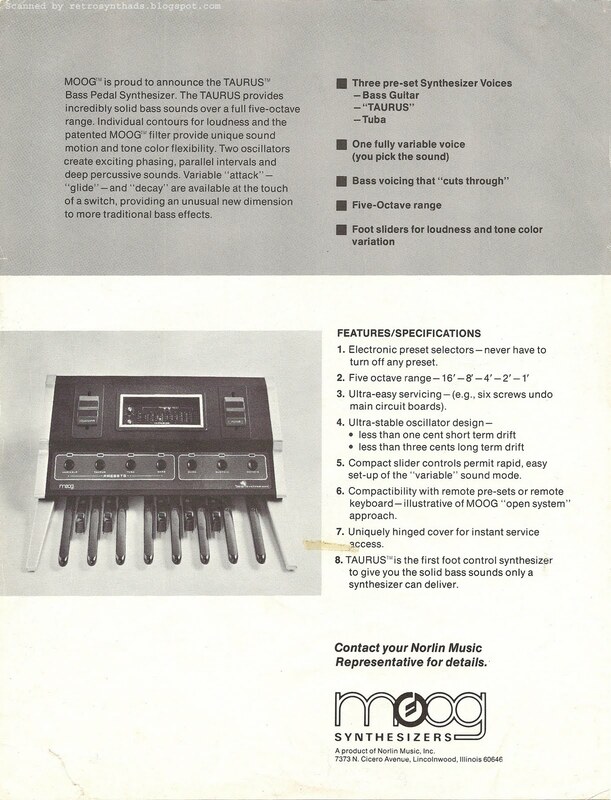 The first is the original name - 'Taurus Bass Pedal Synthesizer'. The name was quickly shortened, both by musicians and officially by Moog in future brochures to 'Taurus Pedal Synthesizer'. I kinda thought the word 'Bass' was a nice touch in the initial name, and much more descriptive. The second, and much more important thing that jumps out at me is how small the Taurus logo is. The Moog logo is so big on the brochure, but that awesome Taurus 'bull' logo only appears as an almost unrecognizable blob (or a jumping cat? :o) on the two photos of the pedals - once on the front, once on the back. You can't even make out the twirl in the bull's tail. I can't fault Moog for wanting to hammer home the fact the Taurus was a Moog product during this introductory phase, but someone should have really pushed for equal billing between the two. At least the logo got equal billing (albeit both are relatively small) on the front panel of the instrument. Moog obviously figured out the bull image was a hot commodity after the launch, and enlarged the logo significantly in later brochures. Also on the Taurus II itself, where there was a lot more room. 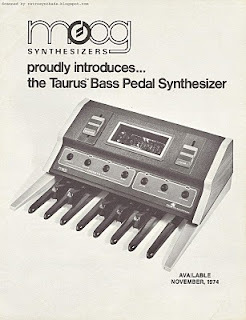 Now, the big question is, where is that Moog Taurus logo tattoo going to look best? Next to the Oberheim logo? Next to the ARP logo? Next to the Aries logo?